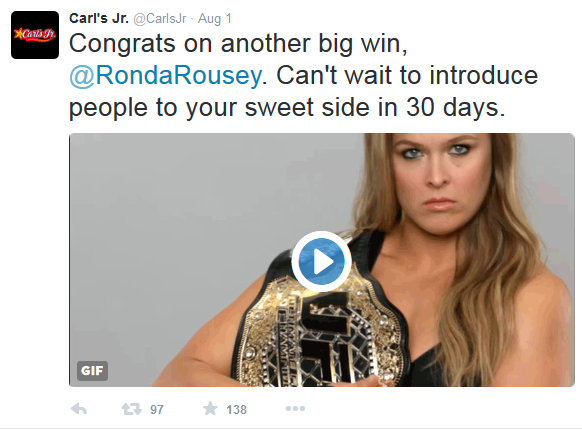 Carl’s Jr. and Hardee’s have announced that the UFC fighter will be the newest commercial star for the brand. “Aside from a variety of other factors, [Ronda] was chosen because she is loved and respected so much by both men and women. ” a spokesperson for Carl’s Jr. tells PEOPLE. The news comes on the heels of the announcement that Carl’s Jr. and Hardee’s first all-natural burger, topped with mushrooms and swiss, will be available nationwide. Rousey is a departure from some of the previous celebrities the company has had endorse their product to include Paris Hilton and Kim Kardashian.